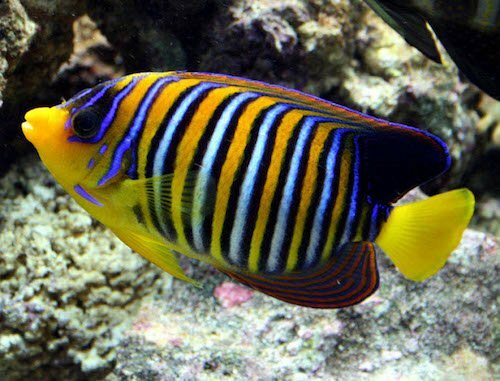 If you’ve seen a saltwater angelfish in person then you understand why these fish are a favorite of the saltwater aquarium enthusiast. They come in a wide variety of colors, patterns and sizes; and virtually every one is beautiful in its own right. 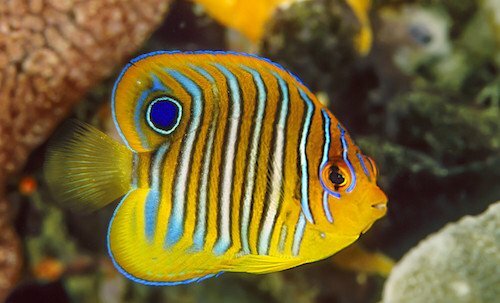 The Regal Angelfish (Pygoplites diacanthus) also called the Royal Angelfish or Empress Angelfish, is considered by many to be one of the most beautiful of all because of its vivid and striking coloring, which consists of a yellow body with blue/purple/white vertical stripes and blue/purple on the top and bottom fins. While the Regal Angelfish is certainly a beautiful saltwater angelfish it is an extremely difficult variety to keep, which makes it best suited to the advanced hobbyist. In the wild, the Regal Angelfish is found in the Northern and Western Indian Ocean, the Red Sea and the Indo-Pacific Ocean. The Regal Angelfish is one of the smaller varieties of saltwater angelfish growing to be approximately 9.8 inches in length. As mentioned, the Regal Angelfish is a difficult fish to care for and keep alive for the long term. This is because they are reluctant to eat in captivity, very shy and introverted. If they don’t get the right nutrition, they will starve. Tank size is recommended to be large — over 100 gallons — despite their smaller size. They prefer a tank to be well stocked with live rock and ample amounts of natural foods they find in the wild such as tunicates and sponges. Also be sure to provide these fish with plenty of hiding places to keep their stress level to a minimum. With most species of saltwater angelfish it’s recommended that you add them last to your home aquarium, but the opposite is true for the Regal Angelfish. Putting this one in your tank first is ideal because it is so shy. If you add it later, it will likely be too intimidated by all of its tank mates, and may hide never to come out again. Most experts also say that bright lighting will keep them from coming out of hiding, so take that into consideration. Many species of saltwater angelfish aren’t friendly to reef environments, but the Regal does quite well as it gives them plenty of places to hide. They will still nip at your corals, but they’re not as destructive as some other varieties of angels. 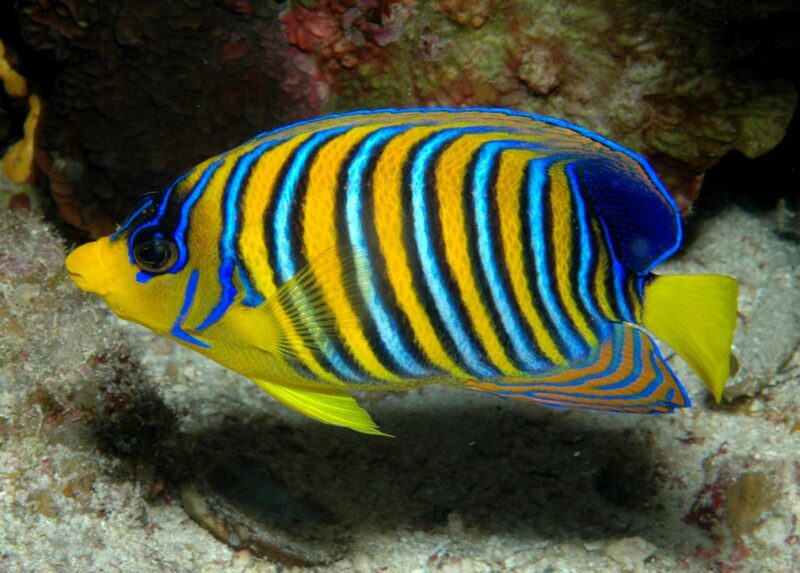 As with most species of saltwater angelfish, the Regal Angelfish is very sensitive to the water quality. 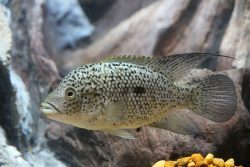 In fact, this variety is a bit more finicky than others, which means you’re going to have to be extra vigilant about maintaining perfect water quality if you hope to keep this fish alive. Because they’re so sensitive to water quality, experts recommend weekly water changes to keep nitrate levels low. Go for a 10% change every week and see how that works, but always check those levels so you can react quickly to any changes. Keep the pH level between 8.1-8.4, water temperature 72˚-78˚ Fahrenheit, medium water hardness, and a specific gravity of 1.023-1.025. If buying from a local retailer, make sure you see the fish eating, and try to observe that on multiple occasions. Try to get Regals that come from the Red Sea or the Indian Ocean because fish from other regions tend to be caught using chemicals, which can significantly reduce the lifespan of the fish. Quarantine your Regal for a few weeks before putting it in your main tank. As mentioned, they are very shy and don’t tend to adapt too well to new environments. This will also give you a chance to observe any diseases or parasites that may show up. As mentioned, the Regal Angelfish is very shy and not aggressive, which means if you’re putting it in a community tank, it’s unwise to house them with aggressive tank mates. It’s also unwise to put two regals together in the same tank. 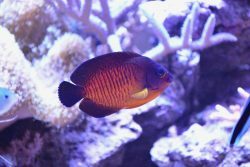 As if all that wasn’t enough to put you off to getting one of these beautiful fish for your home aquarium, then consider that in addition to being very susceptible to the everyday diseases affecting saltwater angelfish, the regal is also prone to starvation because of its refusal to eat. 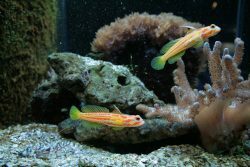 In fact, starvation is the most common cause of the regal’s demise in the home aquarium as opposed to the other diseases, which include Marine Ich and Marine Velvet. As with all species of saltwater angelfish, the key to keeping this fish happy and healthy is to keep their stress level to a minimum. Give your Regal Angelfish plenty of places to hid, pristine water and a high quality diet, and you have a shot at keeping them alive for a good while. 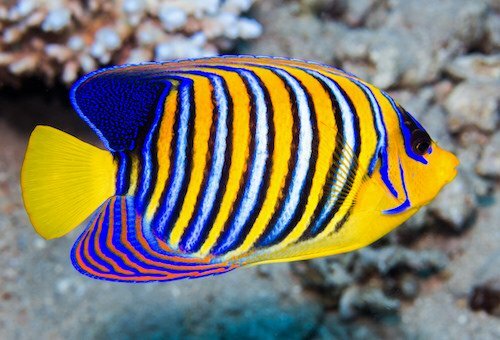 Like most saltwater angelfish, the Regal Angelfish is an omnivore and feeds mainly on sponges and tunicates in the wild. At home, be sure to give them a varied diet that includes red nori seaweed, marine algae, mysis shrimp and chopped krill. It’s also recommended that you supplement their diet with vegetables like spinach or mushy lettuce. Be sure to quickly remove any uneaten food as this can foul the water and cause an increase in nitrates, which can stress your regal. It should be noted that in most cases, your regal will probably refuse to eat for the first couple of days, but if they come out for a nibble after that, you may be ok.
As of yet, the Regal Angelfish hasn’t been successfully bred in captivity in the home nor in a laboratory or farm environment. As you can see, the Regal Angelfish, while stunning in their beauty, are a very finicky and difficult fish to keep in the home environment. However, if you’re meticulous about maintaining perfect water quality, providing them a stress free environment and feeding them a high quality diet, you may be able to keep one of these beauties alive for a long time.